Once again, the attic at the Longenecker house has yielded up its treasures, all flat and light-weight, ensuring I will not lapse into collecting piles of stuff in my own home any time soon. So help me, God! All these artifacts are dated 1967, a very good year, the year of our wedding. Their basketful of goodies, including cookie sheets, mousetraps (mousetraps! ), tea towels and a shredder. I mention that Cliff and I are applying for the marriage license, arranging for guest accommodations, waxing my Plymouth Valiant, already blowing purple exhaust, and seeing the preacher. My letter to Grandma, dated July 27, 1967, refreshed my memory about some events I had forgotten. In this letter, I . . . Mention using church stationery for personal reasons, but noted it is obsolete, so I’m not pilfering. The former pastor, Dr. J. Allen Blair had moved on to radio broadcasting. I suggested that Grandma could hear his broadcast, “Glad Tidings,” on WDAC, a long-time Christian station in Lancaster, PA. Acknowledge gifts from Cliff’s side of the family including the gift of a hand-crocheted pillow-cases with appliques from an aunt and uncle in Oregon. Note that the Beaman family from Washington is already heading east in a camper trailer and will stop off to see oldest son Larry and family in Toronto, Ontario. Remark that pastor doesn’t mind my writing a few notes or making some phone calls during work hours. In fact, he even encourages it. Amazing, now in retrospect – apparently a low-volume office. In spite of all, Grandma Longenecker did make it to the wedding, the photo proof positive! Yes, Grandma Fannie M. Longenecker, age 76, did attend our wedding in 1967. So did my father Ray M. Longenecker, then age 49. 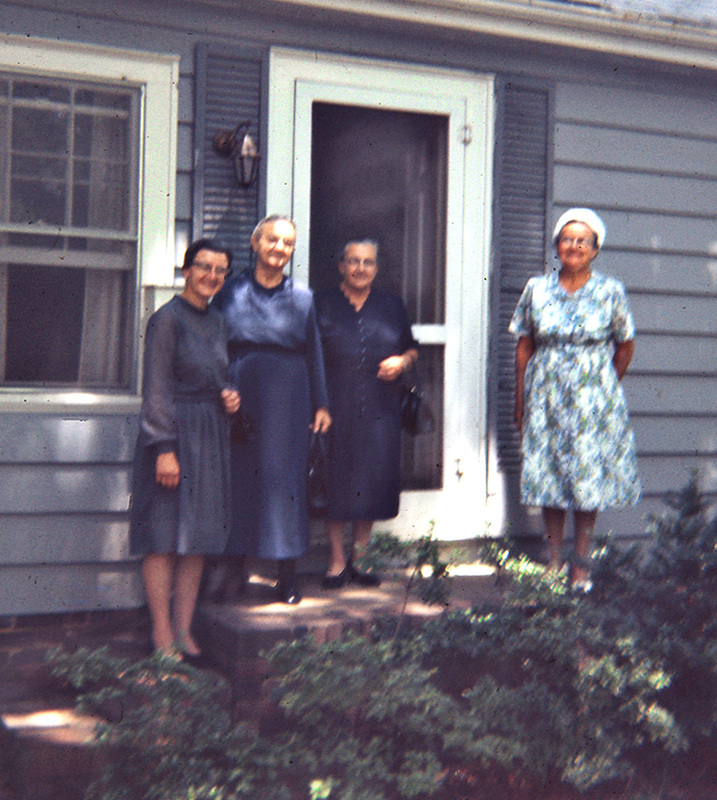 Grandma Longenecker and Aunt Ruthie were house-guests of Morrow Graham during their stay in Charlotte. The Bill from the House of Flowers! No orchids or lilies on a teacher’s salary of course – lots of carnations – still, bargain prices in any decade! 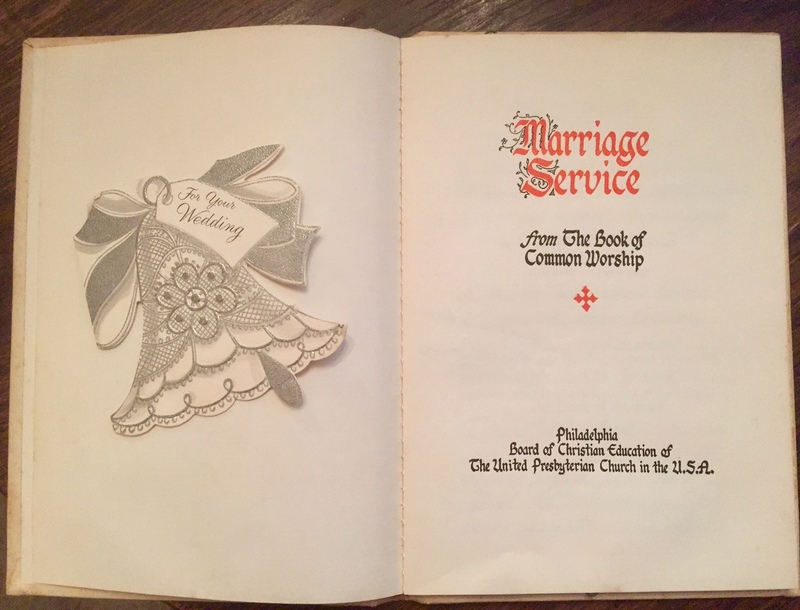 An imprint of the marriage service booklet. As church secretary, I got to type in details on pages following. Arrow at left points to error on date. 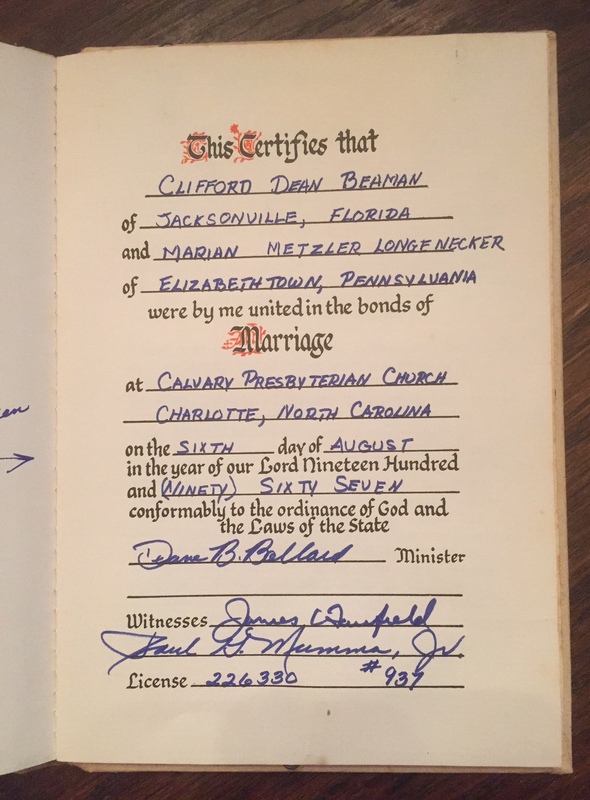 We were married on August 5, not August 6, 1967. Evidently the pastor was already thinking about his Sunday morning message. Good morning, Marian! What finds in that attic of wonders! Thank you for sharing these lovely memories. Both our daughters chose not to have flowers at their weddings. Older daughter had paper flowers that her best friend from elementary school on made, and younger daughter made fans for her and her bridesmaids. Flowers are usually high on the expense list for weddings. How lovely your older daughter had handmade paper flowers, special and unusual. I believe I remember those fans at your younger daughter Jane Eyre-themed wedding. Lots of nostalgia here. Thanks, once again, for being the first responder here too, Merril. I was up extra early this morning, Marian, and a friend was texting me at 5:30! Details, details! No wonder you are such a great researcher. You pay attention to all the details. We know the benefits of getting up early from Poor Richard’s Almanac: Early to bed, and early to rise makes a [wo]man healthy, wealthy, and wise. What great memories the attic has given up to you. Imagine the joy of someone going through your attic later Marian. The Longenecker house has been sold, so no more attic savaging there. What has been curated from the Longenecker attic is in a queue to be digitized.Our own attic is teeny with storage for Christmas decorations, a ladder and such like. I’m keeping a sharp eye on our garage though! Nice to hear from you, Sir David. Hugs back to you too! Being the lover of letter writing, I so enjoyed this, Marian. 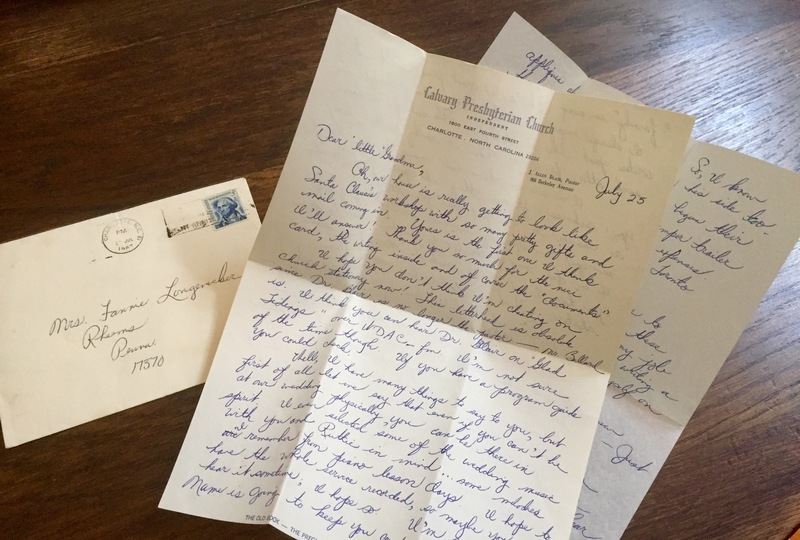 What a treat to find letters you wrote to your grandmother. Thanks for sharing! You are welcome, Jill. We were overwhelmed with the volume of paper stuff we found in the attic. Every single item we or anyone else ever sent to either Grandma or Aunt Ruthie was saved: a boomerang of memories, for sure. It was tempting to just throw everything into the dumpster. Now I’m glad we sifted through the piles. For many, Facebook birthday wishes have replaced greeting cards, but I still buy them and am happy when someone returns the favor. 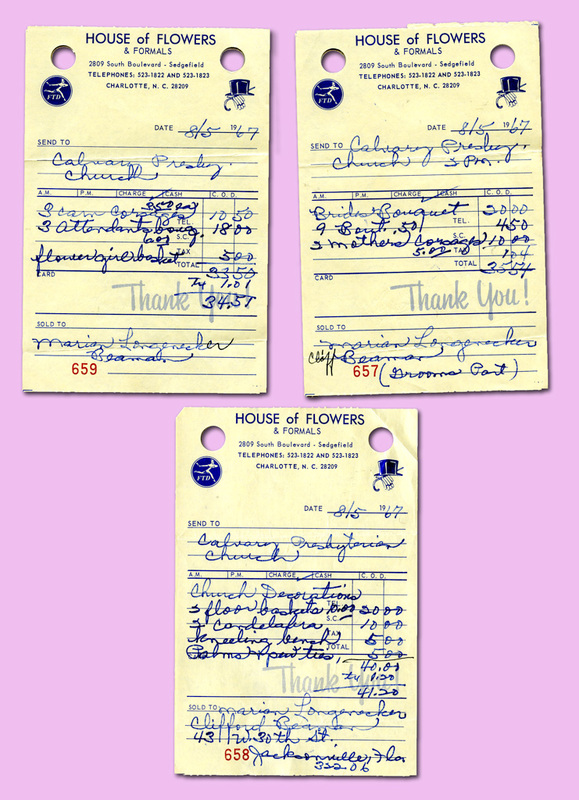 Love those old florist bills, and the inadvertent date on your marriage certificate. I imagine you were aghast when you first saw it. Now, it’s just sweet. I also can appreciate that some of your relatives were not all that happy about you going “fancy.” My father “just” tolerated it, and came to love my husband I think–they shared many special times together that Stuart misses a lot now. Stuart learned much from him in the ways of farm, faith and family. You are a plain to fancy girl too. To answer your implied question: My relatives liked Cliff very much even though they suspected he would take me away from the Mennonite culture. Mother said, “I’d rather have you a happy Christian than a sad Mennonite.” Also, I was in my mid-20s when I met Cliff, old for that era, so I guess they were more accepting since the few others I dated weren’t suitable and they knew it. My Grandma Longenecker liked Cliff too but was most upset when I showed her my engagement diamond. Ironically, a few years later she gave us three grand-daughters her amethyst, pearl and opal rings. She was, after all, fancy to begin with. Ah, the mystery of it all . . . ! Isn’t it great when memories can be carried out of a place in one flat box instead of in a U-haul? You are using technology in a wonderful way, Marian. Determined to spare your own progeny the same work you went to with the Longenecker collection, you can both preserve and reduce the physical remains to their essence. Those letters. All that youthful frugality and scrupulousness about work. And devotion to family. You were trained up in the ways you should go. And now you not only don’t depart from those ways, you share them with light and humor added. Brava. I want to sign up for daily Instagrams with Lydia Ann now. What a legacy you are building with your own family over the years. Again, thank you, Shirley! How fun and exciting to go through the attic! Reading this brought back many memories of my own! Thanks so much for sharing your memories. They are delightful! Thanks, Anita. Going through the attic was not much fun, In fact, most days it was drudgery, but it was exciting, especially when we found treasures like those posted. By the way, Cliff found the bill for flowers when we were cleaning out our garage during the move last year. Now that it’s been digitized, I hope it is gone – gone! What a treasure trove that attic is! Yes, indeed, Fiona. And there is more to come in next week’s post. Thanks for always noticing and commenting in this column! That is just so wonderful, Marian! What priceless mementoes and memories you have of your family. I am so pleased that Grandma Fannie made it to your wedding; that’s a fighting spirit for you. You must treasure this forever. Actually, I didn’t remember at all that Grandma’s coming to the wedding was in jeopardy. Either it was sheer will power or a quick recovery that enabled her to travel such a long distance. Yes, as long as the pixels on WordPress hang together, I will have these treasures digitally. I have been following your travels on Facebook. It looks like you both are having a ball! Hip, hip, hooray! My hat is off to YOU! Laurie, I have you to thank for being the catalyst toward the “eternal lightness of being.” About 2 years ago when we first thought seriously about downsizing, it was you who held my feet to the fire, holding me accountable for throwing out school files I was certain never to use again. In the last year, Cliff and I each got rid of about 1/3 of our stuff + Aunt Ruthie’s house is empty. About these items: If they were not recycled or thrown out, they brought joy to those who received “treasures” we did not want or need. Marian — You crack me up! How lovely for you Marian, to go through those happy memories. Just between you and me: I have some more photos to go through and digitize. A woman’s work is never done! 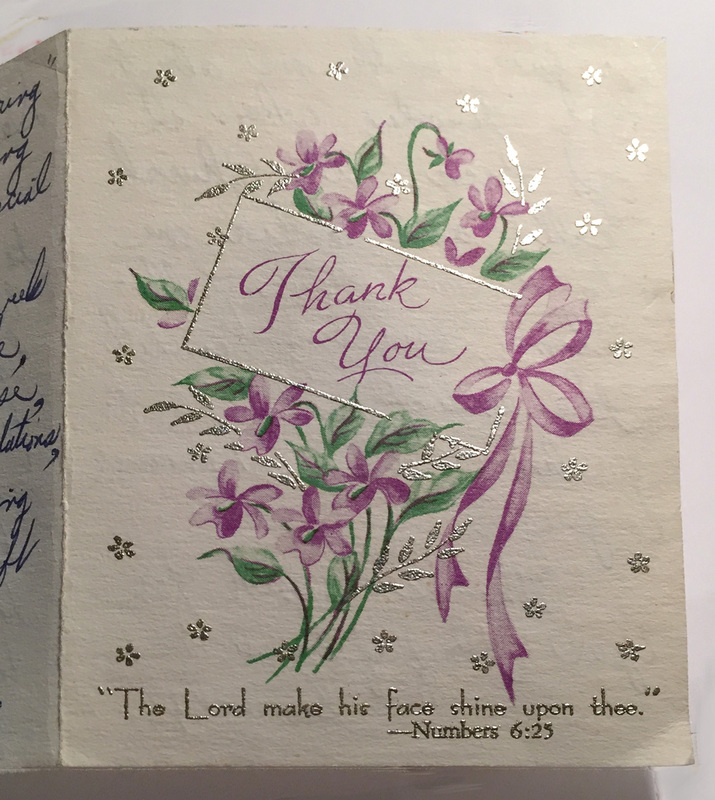 That is a very pretty Thank You note! I thought at first, by the angle of the photo, that it was a decorative Bible or a keepsake box. I also am intrigued by the photo of your Aunt Ruthie and 3 other ladies standing in front of the house. To be honest, I am having a hard time telling which are Plain and which is fancy. Is the floral dress the fancy one? And what IS that white thing she has on her head, anyway? A hat? A bonnet? The floral dress IS the fancy one, my Great Aunt Sue wore a what hat. The plain ones are wearing black bonnets, so the white coverings underneath don’t show up. Thanks for asking; I wonder if others are flummoxed by what I thought was obvious. I’m wondering too about your book tour, Luci. In the middle? Finished for now? Either way, from what I can tell on your blog, the launch is a success. Although mistakes are annoying at the time they are made, they add an element of interest in hindsight! I like the reason you posited for the pastor’s mistake of putting in the wrong date! Something AWFUL happened in Grandma’s bedroom the morning her house was to be auctioned. We were aghast when it occurred, but now it makes for good story. I may write about it in the coming months. As they say in journalism, “Now one has any interest in all the cats that didn’t get lost!” Thanks for noticing, Elfrieda! Now you’ve piqued my interest, for sure! “Fortsetzung folgt” (to be continued) always intrigued me as a child reading stories, and it still does. Now I can’t wait! I know you’ve written at least one post on crazy quips from church people. What were they thinking? Marian, Thank you for inspiring unique memories of family and church. That my purpose – and my joy, Conrad. You look at these posts with more insightful eyes than most because you lived in this culture and perhaps even knew my close relatives. Thanks for chiming in today, Conrad! A mousetrap as a wedding gift. How practical and sweet and funny, all at the same time. Marian, I wonder if you’re the only one who can boast receiving a mousetrap as a bridal gift? Ahh, the joys of keeping and finding our letters and cards. I’ve downsized greatly, but I do have a drawer (well, and several cabinet files) of old cards/letters/e-mails I’ve saved. The remembrances of some of the trivial parts of our lives that end up being so important, in the end. The trivial as important: That could be the theme of another blog post, Pam. I must have been very worried that my Grandma L, one of strongest mentors, probably wouldn’t make it to the wedding. But then I was concentrating on my flowers and bridal veil. Because she actually came, negative thoughts were blotted out. Yes, I’m glad I could retrieve that memory via a hand-written letter. Ahhhhh ! nostalgia …can you imagine having thrown away all those memories . I have heard of people who throw away famly wedding albums , even their own , insanity . Mousetraps !!! 😱We will leave it there .😊 Such a lovely page of your lovely family history , always so enjoyable Marian. I realize answering this that although I had breakfast a few hours ago, you have probably already had lunch, maybe an afternoon nap and thinking about supper. Yes – mousetraps. If I didn’t read the word, I’d never remember such a gift. Our first humble apartment had bugs, but I don’t remember mice – ever. I have no idea what prompted the present. Throwing away wedding albums? Maybe a divorce preceded the purge. Hmmmm! I always hear the lilt in your voice when you reply. Thank you, Cherry! It’s amazing how all these little details add up to create some big memories! I hadn’t thought about it that way, but so it is – a collection of small bits, sort of like feathering a nest I suppose. I’m still getting notifications from you, but I think your website name has changed to Petunias in the Sidewalk. Right? Wonderful. Mousetraps! I love the practicality of it and the nod to the necessities of country living. I use old-fashioned Victor snap traps. They’ve made them for a long, long time. 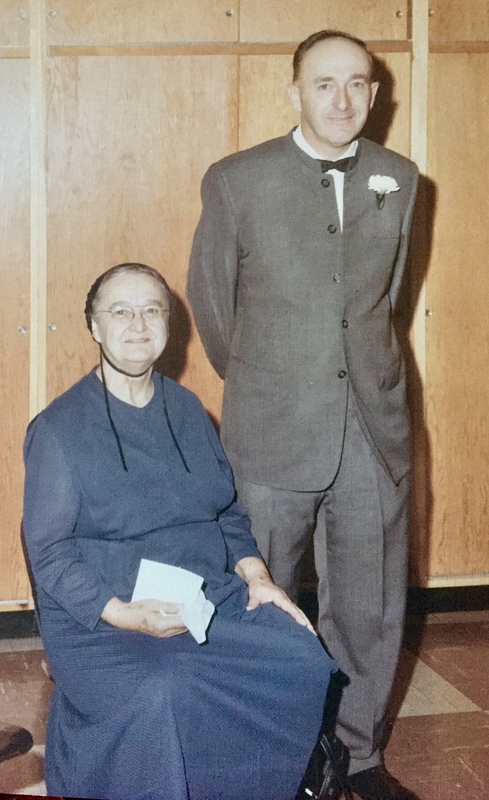 My mother gave me $100 for my wedding in 1968. With that, I made my own dress (a pale yellow lace mini), made desserts and bought fruit, and paid the Unitarian preacher (how much I don’t know). Vic’s mom, seeing what was happening, brought a case of Italian wine and a case of wine glasses. We planned everything–the traditional vows (without the obey part), poems to read, a friend marched us through a friend’s house with a flute, and great dancing music on a record player. I think of that day with great fondness and love the simplicity that overflowed with love. Your mini dress reflected the era. My home-made gown reflected tradition. My gown is gone but I saved the Jackie Kennedy-inspired flat bow on the waistline. Like me, it’s speckled with age spots. I simply love the synopsis of your hilarious wedding. And your mother-in-law stepped up too. That Virginia! AH … Mousetraps for a wedding gift! Ever practical! They were probably Victor (Victory?) ones from the local trap company. I remember dishes, dishes and more dishes as wedding gifts even a silver tea service from my great aunt in Indianapolis Entertaining and serving food was high on the list of skills for a young bride in 1971. AND a plot of land to build a house on from my father…part of the family farm. We had the foundation built and our families helped us complete the rest ourselves over the next 15 years. We were able to move into the empty shell of a house when we returned from a camping trip to New England. There were no interior walls only studs. I washed dishes in the powder room sink, cooked on a camping stove. We had folding chairs and a table and a bed. The pigeons even flew through occasionally. Needless to say I didn’t get to use my silver tea service for several years! I remember my mother and father in law crawling over the roof to lay the plywood sheets over the joists and my 14 year old brother in law doing all the wiring under the direction of my husband. My father and brother hauled extra building materials from the barn with the flatbed hay wagons and the trusty, spit polished green John Deer Tractor. My mother carrying sandwiches and meadow tea up the hill to the job site. Marian, you have sparked many memories for me! I will need to do some writing soon! Thanks for sharing and inspiring! Sending love from PA. Your writing is wonderful, Ann. The details make it come alive. I enjoyed reading about the evolution of your home, incomplete though it was to start. The camping stove reminded me of how we cooked food on our honeymoon in the NC Smoky mountains. And, you probably received crystal and fine china as I did, suggesting I was go carry on my mother’s tradition of Sunday dinners with linen table cloths and a full-course meal. Your building anecdote reminds me of Amish barn-raising although Mennonites in the Lancaster County area helped re-build a barn when fire torn through (twice!). Thanks for the Pennsylvania love too! Thanks for reading and commenting here, an encouragement to me.